If you’ve heard any of my previous episodes, you know I’m a big fan of managers truly connecting with their direct reports. Today, I want to take it a step further and give you all the specifics of how you can start individually connecting with your direct reports in what Is typically called a 1:1 meeting. 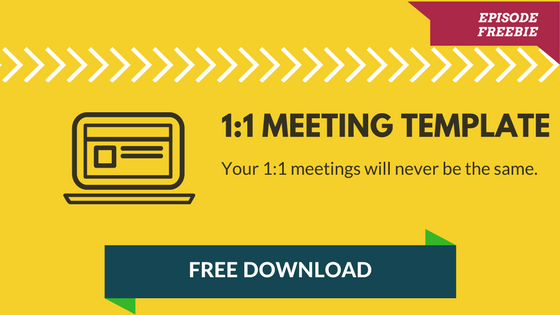 Today we’re talking about 3 specific tactics that will help you have a great 1:1 meeting and then we’ll dive into the exact template I’ve been using for a number of years. I would encourage you to download the 1:1 template so you can keep up with the podcast and start to implement it right away.